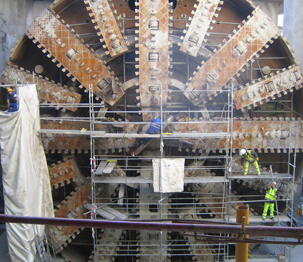 The south by-pass consists of two twin tunnels – the north and south tunnels – with three, 3.5 m wide lanes each and an approximate total length of 4,200 meters, 90% of which have been built with the tunneling machine. 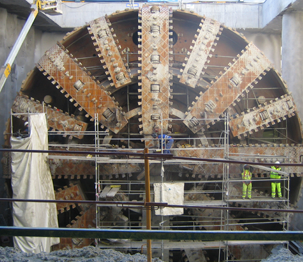 “Tizona”, a 148 long tunneling machine that weighs over 4,200 tons – is the biggest and most powerful in the world. It made the 3,664 meters of the south tunnel of this by-pass, cutting in five months the expected 12 months initially envisaged in the project with peak performances of 46 meters per day. 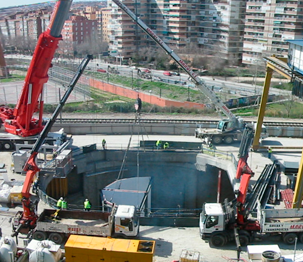 The contribution of Azierta consisted in the providing comprehensive engineering services and geotechnical studies. Thanks to the tunnel, the gas emissions from the vehicles will no longer directly reach the atmosphere unchecked as it was the case now. Instead they will go through the by-pass’s high technology Ventilation and Filtering System which can retain 80% of the particles, significantly absorbing the pollutant gases from the vehicles passing through the tunnels. These features make this tunnel a world benchmark in the application of efficient systems to improve air quality. The tunnel will be among the safest in the world: it includes a gallery for service and emergency vehicles all along the tunnel in both directions, 13 pedestrian galleries connecting the tunnels every 200 meters and 5 for vehicle evacuation every 600 meters as well as 7 emergency exists that directly lead to the outside. It has 464 CCTV cameras, 18 km of fire detection cable, 472 hydrants, 15,710 lights and 112 variable message signs.